Time to rest & recharge! I'll be back in the New Year with more posts on what's the best & hottest in tech & dental technology, but until 2012 I'm trying to recharge. Hope you have a great holiday season!!! Here is a pretty interesting discovery that may make detection of cancer cells easier for both diagnosis and surgical excision. The reagent was developed by a team at the University of Tokyo and the National Institute of Health. The reagent allows detection of cancerous cells smaller than 1 mm. The resulting glow is 20 times brighter on cancerous cells than on noncancerous cells allowing for much easier detection. This means that in the future it may be possible to find tumors at sizes smaller than can be detected by conventional means today. This could allow for better diagnosis of tiny lesions as well as aiding surgeons in removing as little healthy tissue as possible if excision is required. In dentistry today, we are currently using fluorescent devices such as the DOE from Dentlight, the Velscope VX from LED Dental, and the Identafi from DentalEZ to aid in the early detection of oral cancers. However, these devices cause fluorescence of healthy tissue while questionable areas remained dark. These dental devices also use light only and require no use of any chemicals. Here's hoping that this new reagent can have an impact in early detection as well as less invasive surgery. For those of you out there who currently own a Samsung smart phone or tablet device, Ice Cream Sandwich is coming in 2012. I know that a lot of you are using Samsung devices to help manager practices and your lives. You will be glad to know that Samsung is now planning to roll out android version 4.0 starting in the 1st quarter of 2012 to several of its flagship devices. This means that owners of the Galaxy S II and Galaxy Note should be the 1st ones to receive the update which should occur between January and March. After that update should trickle out for other handsets in the line of Galaxy Tab slate devices on the market. However, depending on what model of Galaxy Tab you own you may see an update in the 1st quarter as well. Since different carriers usually have small differences between handsets of the same name, the update on your network may not coincide with the updates on other networks. Personally, I think patience is the key to this whole thing. No word yet on where in line will be those of us with older Galaxy S models. As with past updates these will probably be rolled out automatically by your carrier without any intervention needed on the part of the user. I'll provide more information as it becomes available. Since this blog is about "Technology & Life", I thought I would post the picture above to hopefully get some people thinking and maybe get some folks to appreciate what they have. I saw the above picture on Slate and was really amazed at what it shows. 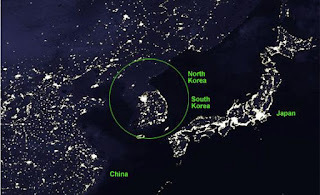 It is a satellite photo of the Korean peninsula taken from space. The amazing part is that South Korea is extremely well lit (as is Japan and China) while North Korea is almost completely dark. This is an amazing way of showing the amount of suffering that is probably going on in the North due to lack of infrastructure and certainly a lack of technology for the general population. It really is amazing when you see the difference. As a technophile one of the things I've always hated dealing with is what I've humorously frequently referred to as “cord control”. Whether it be for earbuds, USB cables, or AC power cords there never seems to be a way to prevent the frustration of cord spaghetti. Needless to say, I was delighted when I came across the little device pictured above. The Applecore is in ingenious device. It literally looks like an apple that has been eaten leaving only the core behind. The ends are slotted to hold the wire, cord, or earbuds in the center area is where the excess cord is wrapped around. This is a quick, easy, and ingenious way to keep your headphones from getting tangled as well as keeping cords that go to your computer from becoming an unmanageable mess of knots. Now that most of us in dentistry are hiding our computers in cabinetry to help decrease clutter in the treatment area, cord management is even more important. Whenever there is a problem that requires accessing the computer the biggest problem I run into his cord clutter. I can see how using the Applecore device can make this problem a thing of the past. For all the details visit the company website. I Artie owned a few of these devices. They are affordable and work well. If you're looking for a way to manage cords and earbuds you should check this product out! Not being one to disappoint, I thought I would share with you something that is just chock full of technology, but serves no real purpose other than to tech for tech's sake. As I've said before, if you are a geek, chances are you have a thing for Lego's. I know *I* do and I know a lot of my geeky friends do too. So, you can imagine my delight when I recently read about a robotic device that can solve the famous Ruik's Cube. However, as they say on those late night infomercials, "But wait... that's not all!" Add to that the fact that the robot is made out of Legos and also uses a Samsung Galaxy S II and you've got the making of a device that has this geek drooling. The device is called the CubeStormer II and is a hybrid device that uses the Lego Mindstorm NXT kit to provide the robotic arms and processor to operate them. It uses the camera on the Galaxy to view and understand the colors on the cube as well as a specially configured Android App. The best part? The robot can solve the Rubik's cube puzzle faster than any human. When you put all of these pieces together, you get a device that is thrilling to a geek and hopefully to you as well. "capture images of each face of the Rubik's Cube which it processes to determine the scrambled [colors]. The solution is found using an advanced two-phase algorithm, originally developed for Speedcuber, enhanced to be multi-threaded to make effective use of the smartphone's dual-core ARM Cortex-A9 1.2GHz processor. The software finds an efficient solution to the puzzle which is [optimized] specifically for the capabilities of the four-grip mechanism. The app communicates via Bluetooth with software running on the ARM microprocessors in the LEGO NXT Intelligent Bricks which controls the motors driving the robot. During the physical solve, the app uses OpenGL ES on the phone's ARM Mali-400 MP GPU to display a graphical version of the cube being solved in real time." I really, really love lasers. I've been an owner and a user of some type of laser for well over 10 years now. Over the years I have found my experience with the devices to be everything that I hoped for and actually more. So much so in fact, that lasers truly have become part of my daily routine in treating patients. In my office lasers are considered to be a routine piece of many of our procedures and we reach for them just as we would any other necessary instrument needed to complete the task at hand. This week alone, as the” end of year rush” arrives in our office we have used lasers to perform multiple procedures while allowing the staff and I to be more efficient as an added bonus. The list of procedures from this week includes multiple composite restorations performed with no anesthesia, soft tissue crown lengthening, troughng the gingival sulcus for impressions, controlling gingival hemorrhage for class V restorations, and a lingual frenectomy. What I find really amazing about that list is that those are the procedures I just happen to remember performing this week; I'm sure that I've left out a few. While laser usage in dentistry may seem exotic and ” cutting-edge” too many, quite honestly for my staff and I they are” just another day at the office”. We have found lasers to be amazing tools that allow us to provide better treatment for patients while also allowing us to perform treatment in a more efficient manner. This means that not only are our patients receiving laser treatment that provides great results, but it also means that the treatment is faster and easier. And let's face it, everyone (including me when I'm a patient) wants to spend as little time in the dental chair as possible. We are currently using diode lasers from Discus as well as a LightWalker laser which is available through Technology 4 Medicine. The LightWalker is a 2 wavelength device featuring the Nd:YAG soft tissue wavelength as well as the Er:YAG wavelength for hard tissues. If you are looking for a way to provide superior treatment for your patients, I really feel a laser could be just what you're looking for. For me, they have become devices that I reach for as routinely as a mirror. They are devices that I use multiple times each day and have become so important to what I do that I simply could not practice without them. I go to a lot of dental trade shows every year. It's the nature of what I do. As a matter of fact, on the rare occasion that I actually miss a show, I usually get phone calls and emails wanting to know what is wrong. People usually figure I'm either under the weather or, perhaps, there has been some family type of emergency that is keeping me home. It's funny that today's post deals with the Greater New York Dental Meeting, because this year was the first year in a while that I wasn't at that particular meeting. Since I'm at a lot of meetings, I can safely say, that it is easy for them to sort of blur together... especially on the exhibit floor where the booths are transported from show to show. Since the same booths are usually used at every major show during a "typical" show season, it is strange how similar the exhibits can look from show to show. However, there are always one or two things that happen at a show that help to make that location and that particular year unique. At the ADA this year, there was The Pride Tech Fair (which I was a part of) that gave CE in an "open" concept classroom right on the exhibit floor. People could be seen walking by while a lecture was being given and many would stop and stay for the entire thing. The Glove Club is famous for having celebrities come to their booth and give away autographs. The folks at Guru patient education sometimes have their mascot "Brusher Bailey" there as a costumed character for photos. Well, imagine the shock and awe that happened at this year's Greater New York meeting when the gang at Gendex unleashed a full fledged Flash Mob outside the Experience Gendex bus. The marketing minds at Gendex came up with the concept of a touring showroom built into a bus and it's been making a trek across the US and Canada since August. It not only goes to dental shows, but also makes stops at dealers and dental offices across North America. Sometimes, like at the ADA & the GNY they actually bring the bus into the exhibit hall and park it on the show floor for tours. This year, to spice things up, and to stick with the theme of "Experience Gendex" the company created a real Flash Mob that surprised and delighted the dentists that got a chance to see it. Fortunately for you, attendance was not required to see the goings on, as Team Gendex also was able to record the event with a few well placed video cameras. Enjoy! I really think this is a great way to put some life into a dental meeting. No one expected anything like this and as you 'll see in the video, people really got a kick out of it. Way to go Gendex! Cosmedent is excited to introduce New www.cosmedent.com featuring faster shopping, dental techniques and in depth product information. Visit Cosmedent’s new website to see up to date technique videos, shop quickly and easily 24 hours a day, ask questions on products or dental techniques, share your cases with the Cosmedent community and view upcoming educational courses at Cosmedent’s very own Center for Esthetic Excellence. Technique videos and special offers are frequently updated so visit www.cosmedent.com today. Also feel free to contact a Cosmedent Customer Care Representative for more information at 800-621-6729. I came across this device and thought it bears mentioning since some of you who read the blog are probably putting together your Christmas list right now. The device shown above is a battery that can be charged in then used to recharge any of your USB devices for up to a week. From what I understand, the device will power any device that has a USB power adapter available for it. About the only things it can't recharge our laptops. if you're like me and spend a fair amount of your time on the road, you probably find yourself swiveling your head as you walk through airports trying to find an available outlet to charge your precious battery operated devices. By using the iGeek charger, you can eliminate the process of trying to find those rare available open electrical outlets. The device is available from thinkgeek.com and Amazon for around $62. When you think of the amount of stomach lining you'll save, to me, that seems like a bargain! Links to purchase are available below. Win a Lego Yoda Santa from Gizmodo... Oh and it's LIFE SIZE!!! No geek is content without a really awesome Lego collection. So, to that end, this year I'm helping you win a life size Yoda Santa made out of Lego bricks. Now, I can't guarantee that you'll win Yoda, this is part of a game of skill that is being promoted by website Gizmodo. You'll have to go to the proper webpage, register, and then wait your turn. It's all part of a game where you control an actual "giant claw machine". If you happen to pull out the Yoda Santa, it's all yours! Rules, etc are available from Gizmodo. Good Luck! Oh... and May the Force Be With You! Malvern, PA – (December 8, 2011) – DentalEZ® Group, a supplier of innovative products and services for dental health professionals worldwide, has officially updated its Identafi® website to include a useful section that provides various marketing tools to help clinicians increase oral cancer awareness and promote the benefits of the Identafi oral cancer screening device. Press Release Template – Designed to announce to local media the importance of oral cancer screening and that the practice has begun using Identafi. Printable Patient Education Pamphlet – This brochure provides patients with information on oral cancer, the importance of the screening exam, and how Identafi works. Printable Office Poster – Dental professionals can hang the poster in their waiting rooms and operatories to create awareness of the need for annual oral cancer screenings. Logo – An Identafi logo can be added to professional websites, bringing public awareness to the use of Identafi. Study Club / Speaker Slides – Preformatted PowerPoint presentation is ideal for use at study clubs or other local speaker events. Radio Public Service Announcements (PSAs) – Oral cancer awareness PSAs in 15-second, 30-second, or 60-second versions, depending on which format the local radio station prefers. Oral Cancer Screening Event Press Release – A downloadable press release that can be sent to local media to invite reporters to receive a free oral cancer screening. Identafi Exam Consent Form – A patient release form to document the patient's consent or denial of the oral cancer screening exam with Identafi. In addition to the many new features, the website will continue to allow visitors to download technical information, find out more about oral cancer, view training videos and seminars, and easily contact StarDental®’s supportive staff of customer and technical service representatives. www.Identafi.net is intended to be a regular destination for dental professionals interested in the oral cancer news and the Identafi oral screening device as well as current customers, and patients. For more information, please visit www.Identafi.net or call 866-DTE-INFO. DentalEZ® Group is committed to advancing the practice of dentistry through innovative products and services. Encompassing six distinct product brands — StarDental®, DentalEZ®, CustomAir®, RAMVAC®, NevinLabs™, and Columbia Dentoform® — DentalEZ® Group manufactures everything in the operatory, from handpieces to chairs to vacuum systems to dental simulation models, creating a complete line of products to elevate the health, comfort, and efficiency of the dental operatory. For more information, please visit www.dentalez.com. I've been a big fan of Lexicomp for several years now. They are an everyday part of my practice, save me tons of time each week, and make my patients safer by allowing me near instantaneous access to any type of pharmacological info that I might need. Interestingly enough, I've also been encouraging anyone who works for a dental practice software company, to integrate the Lexicomp product directly into their software to make things even easier for doctors and their patients... because that's what they are supposed to do... right? Of course you can tell by my last sentence that I haven't been very successful at getting that done. I've tried, but it just hasn't happened. So I was thrilled to receive the following press release. Congrats to Lexicomp and a big Thank You to the forward thinking folks at Carestream Dental for making the incredible amount of info available in Lexicomp easily available to your users!!! ATLANTA and HUDSON, OHIO – Carestream Dental LLC, a subsidiary of Carestream Health, Inc., and the exclusive manufacturer of KODAK Dental Systems, announced it has entered into a comprehensive data-sharing agreement with Lexicomp, a global provider of drug information and drug data solutions for healthcare professionals. “As with many of our products and services, our goal for this partnership is to maximize oral health professionals’ ability to further streamline office management and spend quality time on patient care,” said Patrik Eriksson, president and CEO, Carestream Dental LLC. Lexicomp maintains an in-house clinical team comprised of advanced-degreed pharmacists with significant clinical and academic experience. This team performs daily surveillance of announcements by the U.S. Food and Drug Administration plus pharmaceutical manufacturers. This critical information is compiled and made available to heath care systems regarding drug availability, new dosage forms, and revisions to contraindications, warnings, or other changes. For more information, call (800) 944-6365 or visit www.carestreamdental.com. For other Carestream news, click here. To comment on this article, visit community.pennwelldentalgroup.com/. I've said it many times here, but it just keeps holding true... you just can't have enough storage. I can still remember way back in the early 90's when I upgraded my 486 desktop computer with a 1Gb hard drive. A "techno snooty" friend of mine snorted and said, "What a waste of money. No one will ever fill up a 1Gb hard drive." Looking back that wasn't too prophetic was it? I didn't think so either. The takeaway? Never ever discount the ability of the human race to create "digital packratting". I mean, we hardly ever delete anything any more simply because we don't have to. Our storage capacities expand faster than our copious amounts of digital data. The industry's first monolithic 128Gb part can store 1 terabit of data in a single fingertip-size package with just eight die-a new storage benchmark that meets the ongoing demand for slim, sleek products. SANTA CLARA, Calif. and BOISE, Idaho, Dec. 6, 2011 - Intel Corporation and Micron Technology, Inc., today announced a new benchmark in NAND flash technology - the world's first 20 nanometer (nm), 128 gigabit (Gb), multilevel-cell (MLC) device. The companies also announced mass production of their 64Gb 20nm NAND, which further extends the companies' leadership in NAND process technology. The companies also revealed that the key to their success with 20nm process technology is due to an innovative new cell structure that enables more aggressive cell scaling than conventional architectures. Their 20nm NAND uses a planar cell structure - the first in the industry - to overcome the inherent difficulties that accompany advanced process technology, enabling performance and reliability on par with the previous generation. The planar cell structure successfully breaks the scaling constraints of the standard NAND floating gate cell by integrating the first Hi-K/metal gate stack on NAND production. For the past couple of months, I've been evaluating the Kavo COMFORTdrive electric handpiece. Over the years, I've tried electrics, but my opinion of them was never that high. Now don't get me wrong, there are definite advantages to an electric handpiece over an air turbine, but I was never impressed enough truly want to change. My main concerns were: cord weight, handpiece weight, and repair costs. The biggest disadvantage of the electrics I had tried before the Kavo COMFORTdrive was the drag and weight of the cord. The cords were bulky and heavy... much more so than air tubing. I cold actually feel pull & drag on my hand and wrist. At the end of the day my hand was frequently tired. Honestly I wondered about carpal tunnel or some other type of repetitive stress injury if I used it every day. There was also the weight of the handpiece. Some of the units I tried were heavy and bulky. Then there was maintenance. The electrics frequently would last three times longer before needing repair, but would then cost 4 times more to refurbish. My opinion is now completely different after my time with the Kavo. I have found the unit to be quiet, comfortable to use, light weight, and an overall dream to use. The cord is incredibly light weight and offers no more noticeable weight or drag than standard air tubing. The handpiece itself is incredibly tactile and light. It has a great feel in the hand and provides an amazing amount of torque. No matter what the bur speed, the device is difficult to stall and provides smooth efficient operation when in contact with tooth structure. This means an easier time for the operator and less vibration, noise, and stress for the patient. The body of the handpiece is smooth and easy to hold, but is not slick... no matter the conditions. As far a maintenance, repair costs are still more than an air turbine, but those costs have come down somewhat. I'm happy to report I have had no need for any type of repairs and the device looks as good as the day I took it out of the box despite the fact that it has been under constant use during my testing. We have cycled the COMFORTdrive through both a Statim and Midmark autoclaves without any changes at all. I've also been impressed with the quiet operation and overall "feel" of the handpiece. If you are looking to upgrade to electric or are looking at adding to your electric armamentarium, I feel you really should give the Kavo a thorough look. My mind has been changed about the future of electric handpieces. Nice job Kavo! perio-pathogenic bacteria that are known to cause periodontal disease and helps support clinicians with better risk assessment and personalized treatment options for more predictable patient outcomes. The MyPerioProgress section is a new, third page that is automatically generated for patients who have taken the MyPerioPath® test more than once. It provides a series of graphs that enable dental clinicians to compare current MyPerioPath® test results with previous results. This comparison can provide valuable insight into the progress of the patient’s current course of periodontal disease treatment. 1.An increase or decrease in the reported pathogen(s), especially high-risk bacteria. 2.The common finding of an increase in the quantity of low-risk bacteria (Capnocytophaga species [Cs]) following a successful course of treatment. This spike in Cs is typically a temporary phenomenon. 3.Changes in clinical signs of pocket depth, bleeding, or type of infection (generalized or localized) in the context of similar changes in bacterial loads. By monitoring the above findings, MyPerioProgress will be an added resource to help dental clinicians assess if their patients are trending towards health or continued disease. According to OralDNA Labs general manager Ken Clarke. “MyPerioProgress was designed to help clinicians determine with increased accuracy whether or not the desired end point of therapy has been reached. This determination is achieved by evaluating the clinical signs and symptoms of periodontal disease, and by factoring the risk for disease progression from oral bacteria." •MyPerioPath® identifies the type and concentration of specific perio-pathogenic bacteria that are known to cause periodontal disease and helps support clinicians with better risk assessment and personalized treatment options for more predictable patient outcomes. •MyPerioID® PST® identifies individual genetic susceptibility to periodontal disease and enables clinicians to establish which patients are at increased risk for more severe periodontal infections due to an exaggerated immune response. •OraRisk® HPV is a non-invasive, easy-to-use screening tool to identify the type(s) of oral HPV, a mucosal viral infection that could potentially lead to oral cancer, and in turn, enables the clinician to establish increased risk for oral cancer and determine appropriate referral and monitoring conditions. Quest Diagnostics® is the world's leading provider of diagnostic testing, information, and services that patients and clinicians need to make better healthcare decisions. The company offers the broadest access to diagnostic testing services through its network of laboratories and patient service centers, and provides interpretive consultation through its extensive medical and scientific staff. Quest Diagnostics® is a pioneer in developing innovative new diagnostic tests and advanced healthcare information technology solutions that help improve patient care. Additional company information is available at QuestDiagnostics.com. The buzz around the industry is that Motorola is readying its next tablet for market. The Xoom, was launched last year and, despite the fact that I happen to have one and like the WiFi version, the market wasn't overly enthused and sales stalled at around a half million units. However, now comes word that the company is about to deploy a device that *may* be called "Xyboard" in both 8" and 10" models. The 8 will be sold as a consumer version while the 10 will be focused on business users. It looks like the devices will have 1.2GHz processors and 1GB of RAM. They are also redesigning the look of the device and it will have more of an appearance of Motorola's new phones than of a tablet. This week it has come to light that software called Carrier IQ is present on HTC and Samsung phones on the AT&T and Sprint network. All the companies stated that the purpose of the software is to help diagnose problems with network performance. The uproar has ensued because the software could be used by carriers and device manufacturers to track all kinds of info on smartphones. It can be used to collect almost any kind of data from smartphones that have the software installed. Look for major fallout over this, in my opinion. No one wants to have even the chance of their data being used without their knowledge. For more info, read this article from ComputerWorld. Charlotte, NC (November 30, 2011)– Sirona Dental Systems, LLC announced today that Dental Services Group™ (DSG), a network of 25 North American laboratories, is now providing CEREC® and CEREC® AC Connect users with an attractive rebate and placement program. Both new and existing CEREC AC Connect users who choose to use Dental Services Group for any laboratory needs will earn a generous rebate to help cover the cost of their CEREC AC Connect digital impression system. Rebates are issued in the form of laboratory credits, and are applied to the user’s DSG lab invoice. Rebates range in size based on monthly DSG lab bills, and can cover all financing costs, service contracts, and providesavings on restorations at the highest level. The program is based on incremental business done with DSG. In addition, DSG created a Placement Program for dental professionals interested in having a CEREC AC Connect placed in their practice with no up-front costs. Interested parties simply commit to a certain amount of incremental annual lab work with DSG, and DSG will cover the cost of the scanner. "Our goal at DSG is to provide services that help make our lab customers successful,” according to Buddy Pickle, Dental Services Group CEO. “Providing CEREC milling capabilities and including the CEREC AC Connect in our rebate and placement programs are services we offer to help achieve that goal." For more information, please contact your DSG representative, call Sirona at 855-465-2248, or visit www.inLab.com. Recognized as a leading global manufacturer of technologically advanced, high-quality dental equipment, Sirona has served equipment dealers and dentists worldwide for more than 125 years. Sirona develops, manufactures, and markets a complete line of dental products, including CAD/CAM restoration equipment (CEREC® and inLab®); digital and film-based intraoral, panoramic, and cephalometric X-ray imaging systems; dental treatment centers; and handpieces. Visit www.sirona.com for more information about Sirona and its products. Dental Services Group™ is a network of quality-focused, local labs throughout North America. Partnering with one of DSG’s 25 laboratories provides the personal relationship and care of a local laboratory—combined with the technical expertise and full suite of offerings of a national laboratory. While the foundation of their business is providing high-quality restorations and dental appliances, DSG labs go a step beyond by offering ways to support and grow dental practices. Their vision is to provide relevant services and solutions that will help make practitioners more successful. Learn more at www.dentalservices.net.